The following post is geared towards those that have obtained Diamond status in the Hyatt Gold Passport program. If you do not have Diamond status, read up on what it is and how you can obtain it. Hotels in Tokyo are notorious for strict capacity control. And while the Park Hyatt Tokyo does offer some leeway with regards to children staying with two adults in a base room, they will not allow three adults to stay in a Park Twin or Park King. This will affect you if you are travelling with older children, as all Hyatt hotels in Asia consider those 13 and older “adults” for booking purposes. My Elite rate for a Park Twin room for 39,200 yen per night. However, if we do the same search with three adults, then we cannot reserve a base room, and we cannot utilize the My Elite rate. If we want a similar rate that allows free cancellation up to 24 hours before check-in, we will have to pay a rate 23,800 yen per night higher for a Park Deluxe room. 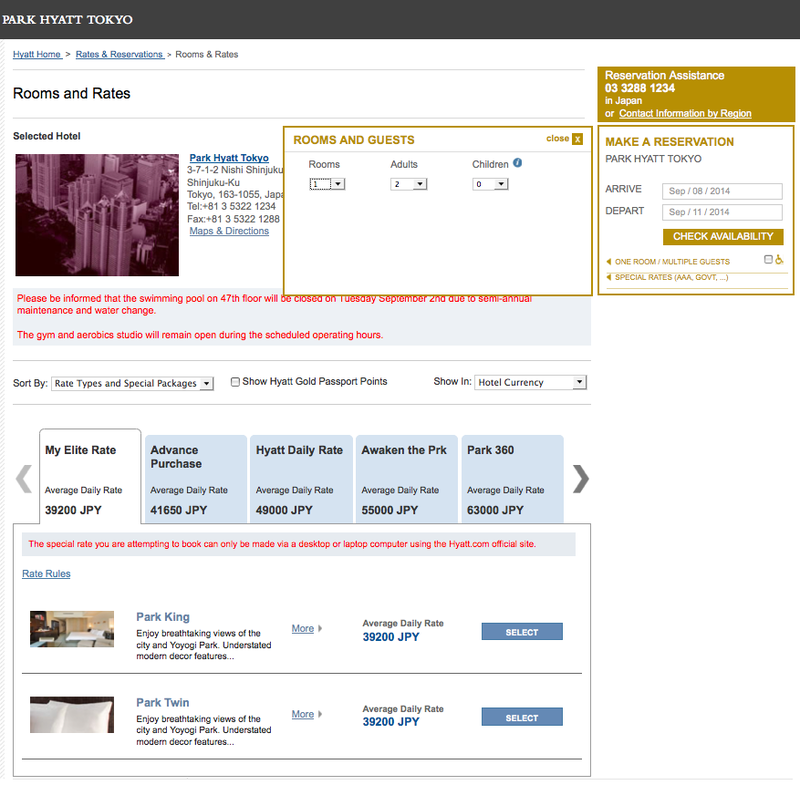 Hyatt Daily Rate for Park Deluxe Twin at 63,000 yen per night. However, we can also see that a Park Suite room is available. Arguably the biggest benefit of Diamond status is the ability to take any paid reservation and, if availability exists, get a confirmed upgrade to a base-level suite, up to four times a year. And the Park Suite does allow for three adults to stay. 1. Book the Park King/Twin room at the My Elite rate for two adults. 2. Call the Diamond Line (available on the back of your membership card) and use one of your suite upgrade certificates to upgrade the room to a Park Suite. I prefer to hang up and make a separate call for the third step to be safe, but I really don’t think that there is anything wrong with doing this, so you could try doing this all in the same call if you like. 3. Since we now have a room that can accommodate three adults, call back and modify your room reservation to three adults. The Park Hyatt Tokyo charges a fee of 8,000 yen per night for adding an adult to a reservation, which brings the final room rate of our suite to 47,200 yen a night. That is 15,800 yen a night less that it would cost to reserve the Park Deluxe room. 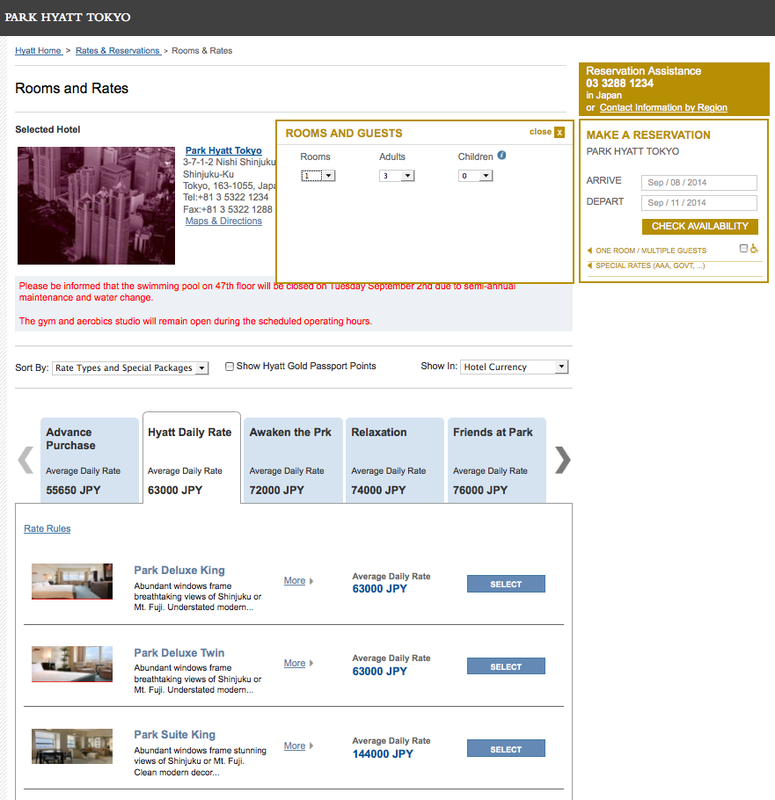 Taking into account taxes and room fees, that would result in a savings of well over 50,000 yen (over $500 USD) for the stay! Used wisely, Diamond status increases the quality of a stay while decreasing the costs. How cool is that?